Everyone is welcome to worship with us! You do not have to be a member of Congregation Mickve Israel to attend services; however, if you are interested in membership, please visit our membership page for additional information. The appropriate dress for our services is business casual, but our dress code is a little more relaxed during the summer. Women can wear slacks. Yarmulke and tallit are not required during services, but we have both available for your use. If you are a tourist, please feel free to come as you are! Our “Regular” Kabbalat Shabbat Evening Service: We welcome Shabbat on Friday evenings with a Kabbalat Shabbat service which begins at 6:00 pm (6:30pm in summer). This service is in the spirit of a contemporary normative Reform worship style. We encourage congregational participation and welcome visitors. Our Classical Reform Shabbat morning services are held at 11:00 am every Saturday morning. Classical Reform Judaism reflects the elegant worship style instituted by the 19th-century founders of American Reform Judaism, using the Union prayer book with emphasis on a gender inclusive contemporary version of Prophetic Judaism and accompaniment by organ and soprano soloist leading congregational singing. The service generally lasts one hour. Guests of all denominations are always welcome, and encouraged to join us for a full luncheon that follows the service. Throughout the year, we host a variety of special Shabbat services to honor various groups in our community. Every year, we honor our Veterans with a service at the Mighty Eighth. We honor the Board of Adjunta and our Sisterhood at their own special services. We have also honored our Museum Committee, Backpack Buddy volunteers, docents and ushers. This year, we will also honor the teachers in our community, our fathers, and our Shalom Ya’ll Food Festival volunteers. During the summer months, our Friday night Kabbalat Shabbat services are not held in the sanctuary but at different locations throughout the area. They are hosted at the homes of our members as Summer Shabbat services and include a covered-dish dinner. Throughout the year we often have meals following services. Please note that reservations are required for Friday night dinners and most have a nominal fee associated with them. Our Saturday morning service is almost always followed by a Kiddush Lunch , which is free of charge. Reservations are not usually required for our lunches. As part of our services we honor our departed loved ones by reading yahrzeit names. Here at Mickve Israel, we celebrate our Jewish holidays with style. 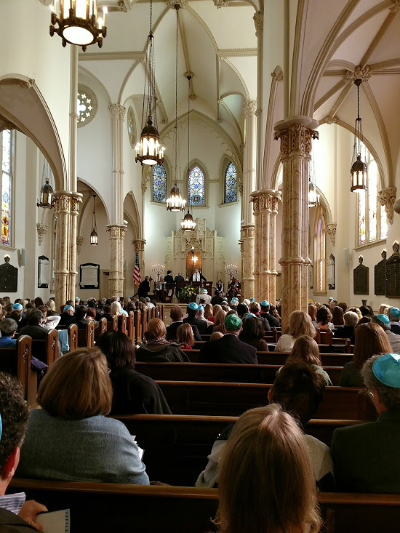 We have special holiday services and events throughout the year in addition to extensive services during the High Holy Days. Specifics about holiday events will be provided when appropriate. We host a variety of amazing special services. Our campers lead a Friday night service every year. We host a Tri-Faith service with a church and a mosque every year. We also host a Jazz service every year in the spring, on a Friday night. We are very fortunate to welcome guest speakers and cantors to our congrgation as well. Guest rabbis, professors, and cantors sometimes just stop by and participate in the service when they are visiting the area on vacation.